Vast "financial, material, and programming support" from national organizations, and a message that draws on social justice rhetoric, have expanded the sophistication and reach of campus anti-Israel campaigns, according to a new report by a Zionist advocacy group. An "information war against Israel and its campus-based supporters" has been launched by student groups with the assistance of national partners, wrote the Israel on Campus Coalition. "[A] broad range of professional groups—including AMP, AFSC, Palestine Legal, the U.S. Campaign for Palestinian Rights, and Jewish Voice for Peace (JVP)…implemented a robust digital engagement strategy, managing websites and social media channels intended for American students," according to the report. The report found that non-campus groups, such as Palestine Legal, have even drafted the boycott, divestment, and sanction resolutions brought before student governments. A number of organizations with direct connections to anti-Israel campus work are a based out of Chicago, according to the report, helping to make the Midwest region a "hub" of such activity for the second year in a row. 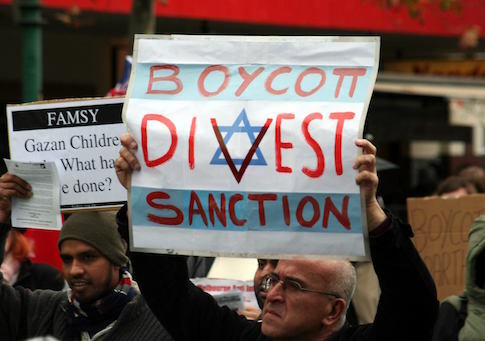 Though the report found that the number of BDS campaigns on U.S. campuses fell by almost 40 percent in 2016-2017, down to 20 initiatives in the last academic year, ICC Communications Director Megan Nathan said activists have increasingly chosen to limit their focus and resources on a select number of campaigns at high-profile universities. Some student groups have also taken to circumventing student government entirely and instead brought their BDS demands directly to the trustees, Nathan continued. Though these attempts have to date been mostly unsuccessful, Nathan said such moves indicate the anti-Israel camp's ability to adapt its strategies as needed, making activists' next steps "very hard to predict." One tactical shift the report identified was in student coalitions with an anti-Israel thrust "disassociating themselves from BDS" explicitly, and instead framing "their activism as a struggle for equality and human rights." "They are playing to the social justice current so popular right now," Nathan explained. She pointed to an anti-Israel initiative at George Washington University called "Divest This Time," in which the university was urged to not repeat its actions of the 1980s, when GW did not divest from apartheid South Africa. The campaign came within one vote of passing a student government pro-BDS resolution in May. "It's not about throwing out the BDS idea, but shifting the message to be more nuanced, sophisticated, and attractive," said Nathan. The report warned Zionist students to be particularly vigilant around Jewish holidays—such as the Rosh Hashanah, or New Year, taking place at the end of the week—as the ICC tracked multiple occasions of anti-Israel efforts launched on or around those days when observant Jews would be off campus to celebrate with their families. This entry was posted in Culture and tagged Israel. Bookmark the permalink.